I´m glad to share this recepie of a great tasting cake. Whip the eggs and sugar into foam. Add the melted butter and lemon juice which is diluted with water. Next add the flour and baking powder and make it an even mixture. Pour the mixture into a greased cake-tin. Add the rhubarbs on the top and some sugar. Put the cake in the oven for 25 min, 175 degrees C.
In the mean time mix the ingredients for the top. Add the oatmeal and sugar into the melted butter, add also the remaining ingredients and stir well. 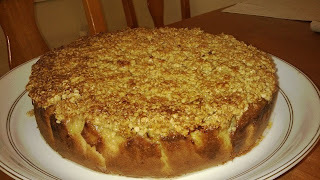 Take the cake out of the oven and spread the tosca on top and continue the baking in 200 degrees C for another 15-20 min.